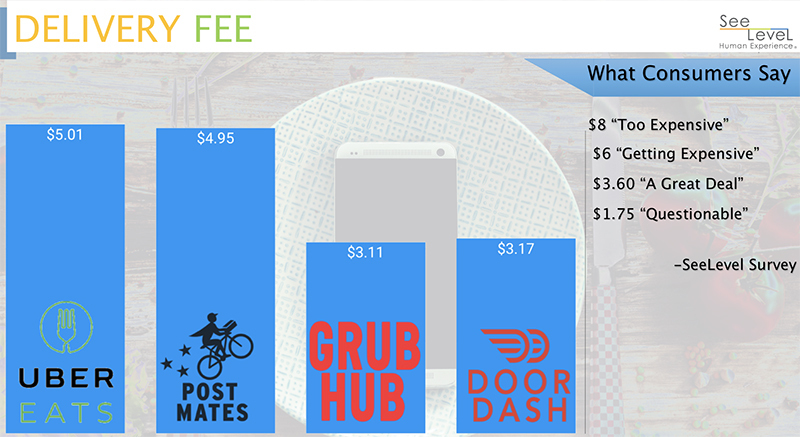 One of the biggest questions from restaurateurs is how the various third-party delivery providers stack up. According to new data from mystery shopping and survey firm SeeLevel HX, things are fairly even in an ever-changing segment. In a research project sponsored Food On Demand, the study is the first of its kind to take a close look at the leaders in third-party delivery, with an army of 1,400 mystery shoppers across the country. SeeLevel also conducted a large consumer survey to see how users of third-party delivery engaged with those delivery providers. One big talking point is the speed of delivery. 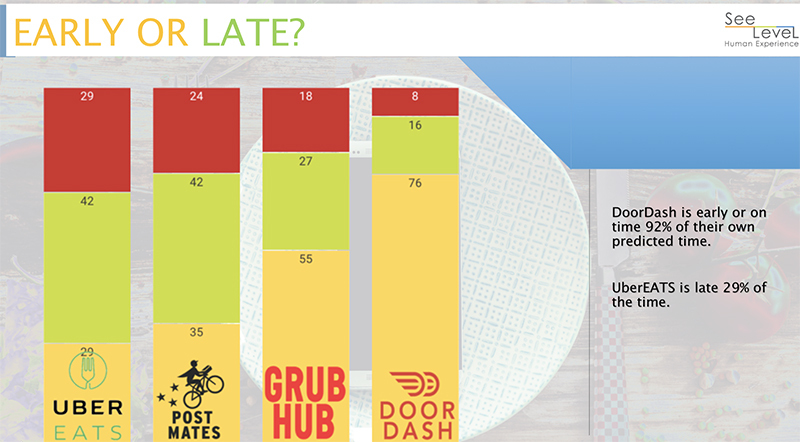 UberEATS was the fastest at 35:31 on average, followed by Postmates at 40:12, DoorDash at 41:01 and Grubhub at 50:22. “I hadn’t seen the data before this morning, but it’s kind of fun to come in first on the speed metric,” said Bowie Cheung head of regional operations at UberEverything for U.S. and Canada during a session at the 2017 Restaurant Finance and Development (RFDC) conference. “It appears that there is some different strategies going on, there’s some that estimate high and deliver in a much shorter time, and there’s some that try to estimate exactly when it will come,” said Lisa van Kesteren, CEO of SeeLevel HX during the session. “In a mature version of this world, because we’re all learning this, the green segment should be very large and should be the vast majority of the bar,” said Cheung about the graph (pictured above). He said one factor was that restaurants could choose to delay order pickup times when the restaurant is very busy, after the estimates already have been relayed to the diner. Order times and ticket prices varied significantly from market to market. 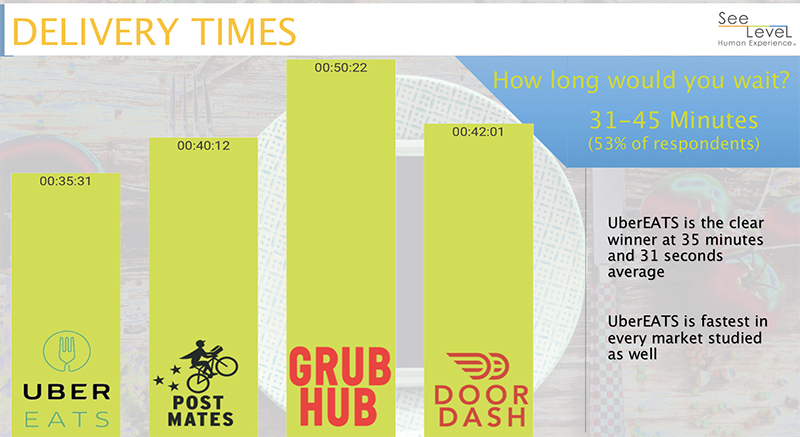 Atlanta had the longest average delivery times, across the board, orders took 45:41 to get to consumers. The fastest market, despite all the talk of traffic, was Los Angeles, orders there got to consumers just seconds shy of 40 minutes. 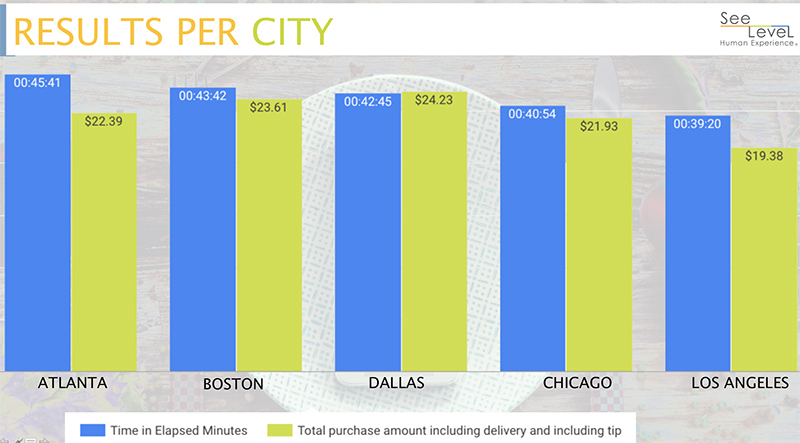 The highest tickets were seen in Dallas where diners spent $24.23 on average. Los Angeles also saw the lowest ticket prices at $19.38 on average. How exactly those numbers shook out is a bit of a mystery, but may speak to the different restaurant landscapes across the markets in the mystery-shopping project. It seems that L.A. consumers order things that are closer and given the stiff competition, prices there are somewhat cheaper. Dallas has seen a wave of growth, especially among high earners at major corporate headquarters; which may push that ticket price higher. And while traffic is bad in every major city, it’s pretty clear that Atlanta traffic is just awful. Cheung said each market presents a completely different challenge. 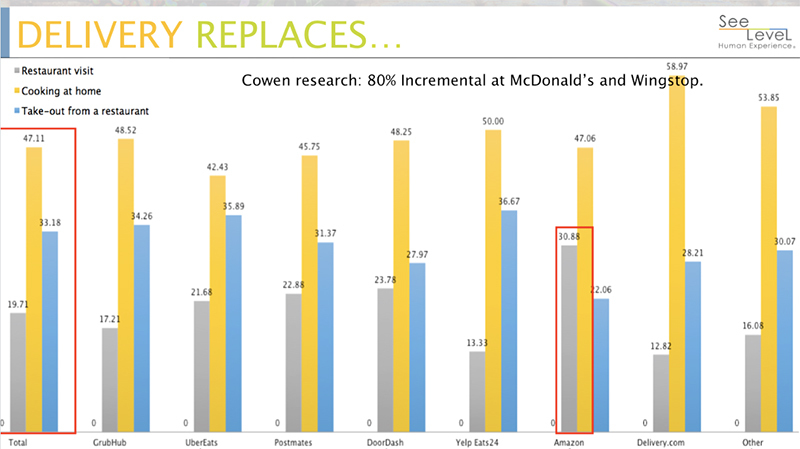 Other research from investment bank Cowen shows that delivery is largely incremental, and again, another Food On Demand exclusive data point from the SeeLevel survey shows that few at-home diners are replacing restaurant visits. Overall, 47 percent of diners said orders replaced cooking at home, 33 percent said it replaced take-out from a restaurant and just shy of 20 percent said it replaced a restaurant visit, meaning it’s 80 percent incremental. If you’re interested in purchasing the entire survey results, contact Steven Maskell at 917-755-8849 or Steven.Maskell@seelevelhx.com.